Do you always have mixed emotions? Are you often feeling mad or sad? Having emotions is quite normal. Learning how to master your emotions is very crucial to your success and happiness in life. I have personally struggled with this, which is why I’m still working on controlling my emotions. 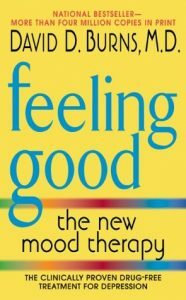 Feeling Good is a book that teaches you all about emotions in a very informative detail. I would suggest that when you are dealing with emotions. this is an amazing book to refer to. Being self-aware allows you to start taking action for yourself. When you realize that you are not bound to your thoughts, everything will change. Self awareness will allow you to notice that when you feel a certain emotion, you just have to steer your thoughts in the right direction. You are in control of all your emotions. For example: Getting mad or frustrated allows you to slow down and be patient. Many a times, your estimate of an emotion is ultimately what you’re thinking about, and not actually the thing itself that is controlling the emotion. Manipulation is also a big part of controlling your emotions. This book provides different techniques about manipulation. Yoga, isolation tank, exercise, and breathing techniques are all tools that can help you to control your emotions. There are so many ways to take control of your life and emotions. Start taking control of your mind and the way you think. Soon enough, this will turn you into a completely new person who has a better control over his mind and his thoughts. Expressive: How you react to your current emotions with actions. Subjective: How you perceive and experience an emotion. Physiological: How your body reacts to the emotion.